Huyen Truong and Steven Tait are medical marketing professionals enthusiastically sharing their in-depth knowledge of digital marketing in the medical practitioner space. We reveal crucial ideas and tools to build your online marketing palate, and dive into questions relating to SEO, blogging, web traffic, referrals and many more ideas. Steve discusses how most healthcare professionals are still trading time for money, and if they can’t find ways to free up your time, it is impossible to scale your practice up. We also point you towards our video, “8 Steps to Automate Your Marketing & Scale Your Practice Up”, and we’ve provided the link below. We would love to hear from our listeners in comments below! While you’re there, be sure to subscribe to our blog and become OMD insiders to gain instant access to our training, videos, podcasts and ebook library. 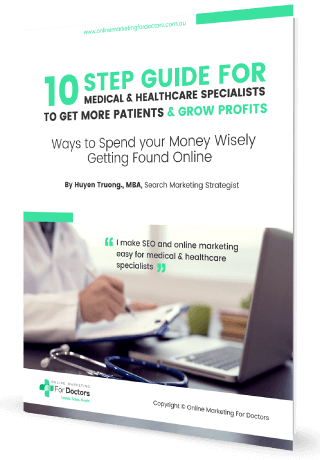 Huyen – Welcome to another episode of Online Marketing For Doctors Podcast. We are your hosts Huyen Truong and Steven Tait and today we are going to cover the most FAQs about the Medical Marketing that we have received so far. One of the most important keys to a financially healthy practice is marketing – but not just any marketing. We’re here to chat to you specifically about medical marketing. 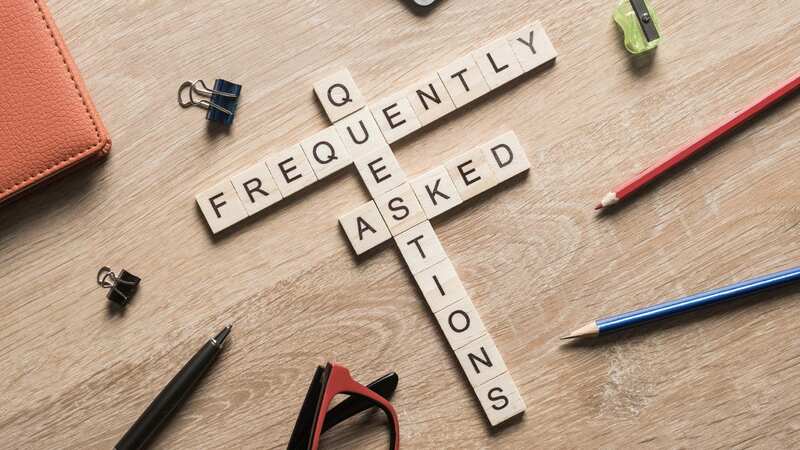 And after years of working with many healthcare professionals, we’ve even put together the 8 most frequently asked questions when it comes to medical marketing. Steve – The first question is – How much should a medical practice spend on marketing? The answer to this can be a bit confusing, as if you do a little research on the web you’ll find a wide range of recommendations; anywhere from 5% to 20% of a practice’s revenue is recommended as the “right” number. The truth, though, is that no one-size-fits-all strategy exists. Your marketing plan should be based on a number of factors: your medical area of expertise, geographic region, life time value (LTV) of your patients, and goals of your practice. Then, you also need to consider Patient Acquisition Cost (PAC). Your practice’s PAC is the amount spent on marketing divided by the number of new patients you acquire in a given month. For example, if you spent $5,000 on marketing that month and acquired 50 new patients then your patient acquisition cost is $100 per patient. If a new patient is worth $500 in profit then the practice in this example has a highly profitable marketing plan. Huyen – That’s a great number for smaller areas, but practices in big cities will want to see higher patient acquisition numbers. If you are located in a big city, add 3% to your budget, as you’ll need a sufficient allocation to reach a larger pool of patients and compete against a higher number of competitors. Consider offering new products or services, and increase your marketing spend by 2%. If you’ve already added and introduced new high-profit services and products, add 5% to your marketing budget, as you’ll need to aggressively market those items. Have you noticed a loss of market share in your area? Add 2% to your budget to move to the forefront of Internet medical marketing in your area, as the vast majority of practices still do not aggressively market themselves. Start small and work with your digital marketing agency to stay focused on what is or isn’t working. Increase your budget in the areas that prove profitable and eliminate or reconfigure those that aren’t. With this approach, your marketing budget is calculated based on your desired level of growth. For example, if you want to grow your practice’s collections revenue by $200k this year and you utilise a conservative ROI ratio of 3:1 (a return of $3 for every $1 you spend) then you can expect an annual marketing budget of $66k. That does not include any current marketing expenditures the practice is responsible for (regardless of ROI), which must be added to the budget. Steve – The second question is “Should physicians use social media? Did you know that the healthcare industries in the U.S. and Europe are actively pursuing social media outlets in promoting their business? While many doctors and dentists are somewhat cautious about joining the trend because of some potential privacy breach or negative reviews online, it can’t be denied that social media is revolutionising global healthcare marketing. Facebook has 2.2 billion active monthly users worldwide, making it the most popular social network on the planet. Have you ever visited a website and then seen their Facebook ad in your newsfeed shortly after? This isn’t a coincidence! It’s an advertising tactic called remarketing, which allows you to advertise to your recent website visitors. If someone visits your website, and does not enquire or contact you, you can re-engage them with Facebook advertising. A very clever, beneficial tool to use. Huyen – Facebook advertising can drive repeat business from patients who have used the services from you in the past or who have been your website subscribers. By using Facebook’s “audiences” feature, you can import your patients’ emails into your Facebook advertising campaign. This will allow you to advertise directly to the audience that is most likely to enquire and engage with you. If you haven’t already started investing in Facebook, you should consider doing so. I’m willing to bet that your competitors are already running their own campaigns, or at least will be soon — either way, the window of opportunity isn’t going to remain this wide open for long. Stay ahead of the pack! Huyen – The next question is – What’s the difference between traditional and digital marketing? Although digital marketing is a fairly recent phenomenon, it has absolutely exploded in popularity. This method of advertising has rapidly evolved as technology has improved over the past couple of decades. Examples of digital marketing include websites, online banner advertisements, SEO optimization, blogging, YouTube videos and social media mentions. More and more practices are making the transition from traditional marketing to digital marketing because they can target specific audiences that may be interested in their services. A huge benefit of digital marketing is the fact you typically spend much less than you would on traditional marketing. There’s one crucial thing you should always keep it mind in marketing – if you can’t track you can’t manage it, so our advice is not to invest in anything if you can’t measure the success. While it is difficult to track the effectiveness of traditional marketing broadcasts, with digital marketing you can track your online campaign’s success by many different dimensions such as: • Number of impressions • Number of clicks • Number of enquiries • Number of visits to your website • Visitor engagement on your website. With this data in hand, you will be able to figure out exactly which marketing efforts are working the best – and just as importantly which ones aren’t working. Then, you can refine your digital marketing strategy for future success. Huyen – Another popular question – When Should I Redesign My Healthcare Website? This is a very popular question that we often get from practices – and a very important one. We all have belongings we hold onto for way too long; Things that are way past their prime but technically still function, so you might ask why bother replacing them? As you know, nowadays, many of your prospective patients and referral contacts’ first impression of your practice will be based on what they see on your website. I’ve seen way too dated medical websites – some that aren’t even viewable on mobile devices, yet they are still out there online representing practices. Don’t fall into this trap! First of all, you need to determine whether your website is mobile friendly and/or does provide a seamless experience across all devices. More than 56% of all healthcare website traffic comes from mobile devices. If your site isn’t responsive or mobile friendly yet, the chances are very high that you’re losing leads and maybe even potential patients. Secondly, are you not getting the results you want? If you aren’t happy with your results, it’s time to redesign. Examining your site’s conversion rates — visitor-to-lead and lead-to-patient typically being the most important — can provide you with a clear idea of what needs to be adjusted on it. Steve – Thirdly, does your site no longer reflect your latest business purpose and marketing strategy? Or does your site look out-dated, has confusing navigation, and / or you rarely get positive feedback on your website? Another important reason to get your website updated is when your prospective patients and referral contacts can’t find you online. Your website is possibly not being found because you don’t have the right keywords in order for your practice to come up in search results. If that’s the case, that means your website is just purely an online catalogue and not working as its role should – which is to drive target patients and referral contacts to your website. Finally, have your competitors changed their site? If you’re on the fence about investing in a website redesign, we’ve compiled a list of nine reasons it’s time to pull the trigger on a website redesign within our video What Medical Website Elements Bring In New Patients .We’ve put the article and video link below this episode summary so you can have a closer look at them. Huyen – Another interesting question – How do I get more patients to visit my website? This is very good and popular question from many practices. There are two main concepts to digital marketing: bringing them in and keeping them. Your primary focus should be driving that traffic to your website to begin with. First of all, Search Engine Optimization (SEO): This is the process of increasing the visibility of your website in search engines. The key to search engine optimisation is to ensure that the content of your website, keywords and phrases, are something that a patient is most likely to search for in engines like Google. So think of key words that directly relate to your business that people might enter into a search engine. Facebook and Instagram: Every day millions of users log in to use social media sites – with the average person spending 8-10 hours a month. With Facebook and Instagram ads you can laser target your audience by their age, gender, location, interests, occupations – the list goes on! You can also retarget website visitors and your email list database, and other similar audiences, via the advanced targeting on Facebook ads. It’s a very powerful tool! Steve – Another quick way is Google Adwords: Also known as Pay-Per-Click (PPC) online advertising, Google Adwords place your website in an eye-catching location within search engine results. The utilisation of AdWords allows Google to create a small ad that hooks the user and directs traffic your way. Blogs: Statistics show that websites with blogs accompanying them – or websites that are featured within popular blogs (your referral sites) – have the highest amount of traffic. So consider blogging and sending out your latest blog posts to your email subscribers to drive them back to your website. Another thing you can consider is getting yourself out there featured as a guest on popular blogs – another great tool to drive visitors to your website! Huyen – another popular question, especially from Specialists – How can I increase doctor referrals to my practice? This is also a top FAQ from medical practices, especially from specialists. When it comes to building a network of engaged referrers, it is all about relationship building and sharing your knowledge to establish yourself as the trusted source for referrers to turn to. 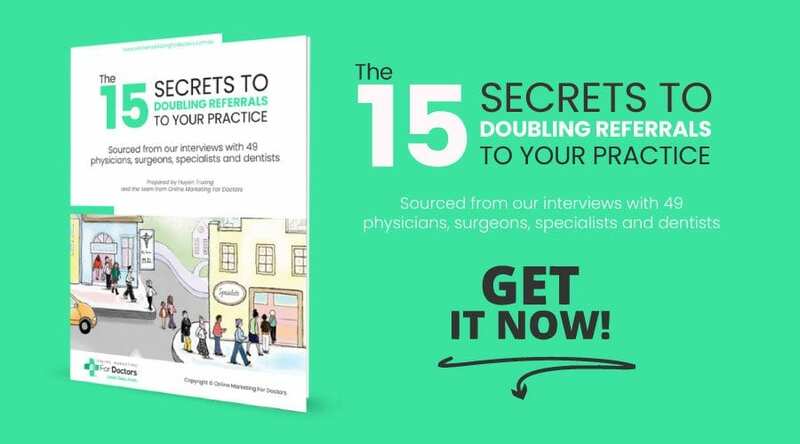 We have put together an eBook called the 15 Secrets to Doubling Doctor Referrals to Your Practice, which was written based on our research – including 49 in-depth interviews with primary care physicians, specialists, surgeons and dentists. You can find the link to download the eBook below this episode summary. Steve – I’m very time poor, but should I blog? Any other options? Although blogging takes some time, it’s usually very beneficial. According to Pew Research Center, 72% of U.S. adults have searched for health information online. This makes becoming a source of commonly searched health information for your patients a vital part of any marketing strategy – and the best place to do this is through a blog on your website. Many practices ignore the opportunity regular blog posts present to connect to patients – don’t become one of them! Blogs can also provide valuable information, and lead to your page website/ blog an expert source. If you post regularly — at least twice a month — with information your patients are searching for, you position yourself as a health authority who they’ll seek out when they’re in need. Huyen – Now of course, let’s get back to that key problem we constantly hear from all medical professionals – the fact they’re time poor. The solution to help out with this when it comes to blogging or producing content for your website is a strategy called “batching” – meaning producing several pieces of content in one go. For example, for this very podcast channel we produce and record 8 episodes in one go! For you, to get you through two months of content, I would recommend setting a time for to complete 4 blog posts or podcasts in one go. Blog posts can be in article format, or if you prefer to speak instead of writing, you can consider recording your content and producing podcasts instead. Popularity of podcasts are on the rise, and they’re very mobile friendly and suitable to the modern target audiences, who are always on the go -driving, walking or on public transportation – and also to people who are looking to improve themselves. Steve – Another excellent question – How can I scale my practice and reduce the trading time for money? This is a key question that all sorts of businesses tend to ask – as it’s the key to take your business to the next level. As you know, most our healthcare professionals are still trading time for money, and if you can’t find ways to free up your time, it is impossible to scale your practice up. This is a very interesting topic, that is why we created a video specially for this subject called 8 Steps to Automate Your Marketing & Scale Your Practice Up, and we’ve added the video link in the show note for you to check it out. As always, I love to hear your feedback! So I have this last question for you: What are some marketing questions that you haven’t been able to figure out yourself? We’d love you to share these questions with us so we can help you answer them, or even get an answer from a similar successful practice for you. So please leave your comments now, and while you’re there be sure to subscribe to our blog and become OMD insiders – which will give you instant access to our training, videos, podcasts and eBook library! I hope that you enjoy this episode and I will catch you next time.